I had my drums of the rear of my 710 recently... and one side is badly worn down. It has about 50K miles on it so likely the original shoes, and if so likely they are on correctly. Anyway I tried to find out which shoe goes to the front and which the rear on the new set I have, you know just in case. I looked everywhere and everything said contradicts everything else. There seems to be several rules for the leading and trailing shoe... like "the front shoe always has the smallest (shortest) lining" Great, mine are identical length linings but two are closer to the wheel cylinder and two farther away on the shoe.... so which one goes to the front? 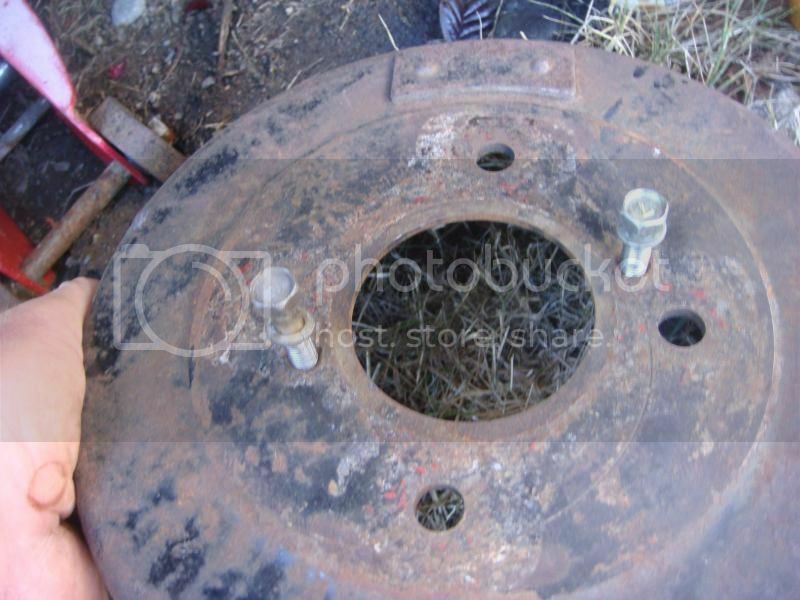 All pictures show a wheel cylinder at the top and the adjuster at the bottom.... mine and the 610 have the wheel cylinder at the bottom. Anyway here's a picture of two shoes. 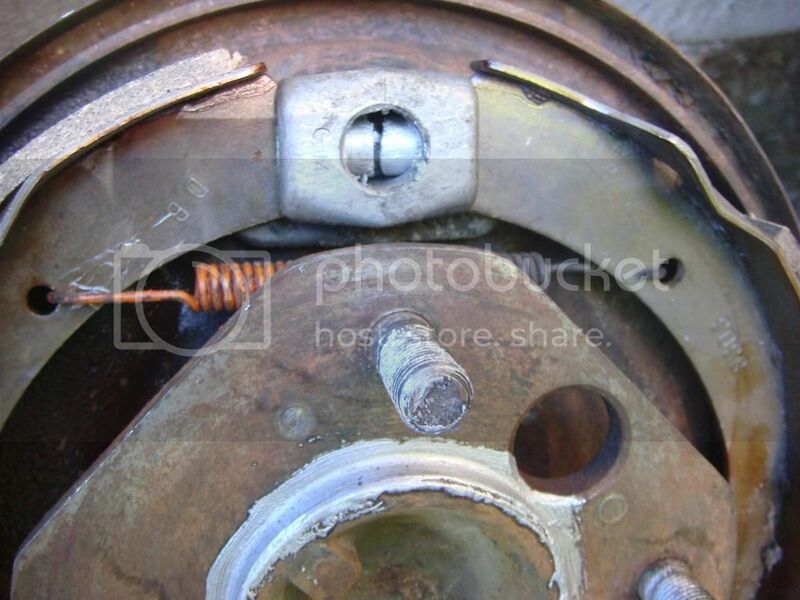 Wheel cylinder is at the bottom, adjuster is at top. As you can see the pad material is much closer to the bottom on the right shoe than the left. My question is... if the wheel turns clockwise, are these shoes positioned correctly? Back this up with an explanation. Mike, I can only give you my logical thought on this as I don't know off hand which is "correct" from the factory. I would think that the pad material would be closest to the wheel cylinder side, opposed to the moreless fixed adjuster side if they were mounted mirror image of one another. This assumes that two shoes have the material in one location while another pair of shoes has material on the opposite end of the shoe. If all four shoes have the material in the identical location, I would think that the shoe on the wheel cylinder side has the material closest to it and the second shoe is opposite with its material closest to the adjusters. In the way the expanding arc of the two shoes is evenly drawn into the drum. Now I'll go and consult literature to back up my thought process. So far so good Byron. Now the popular theory is that the shoe closest the wheel cylinder that is moving in the direction of the turning wheel... in this case the left one... gets dragged around by the turning wheel and gets a free assist. This means the left one 'grabs' better than the right one. Now, as they are L&R interchangeable the only differences is that the lining is either closer of farther away from the wheel cylinder on the left side. So, should the lining on the left side be closer or farther away from the wheel cylinder because of this braking assist on that side? Byron thank you so much for the help in this. Can't afford to pull any more hair out. 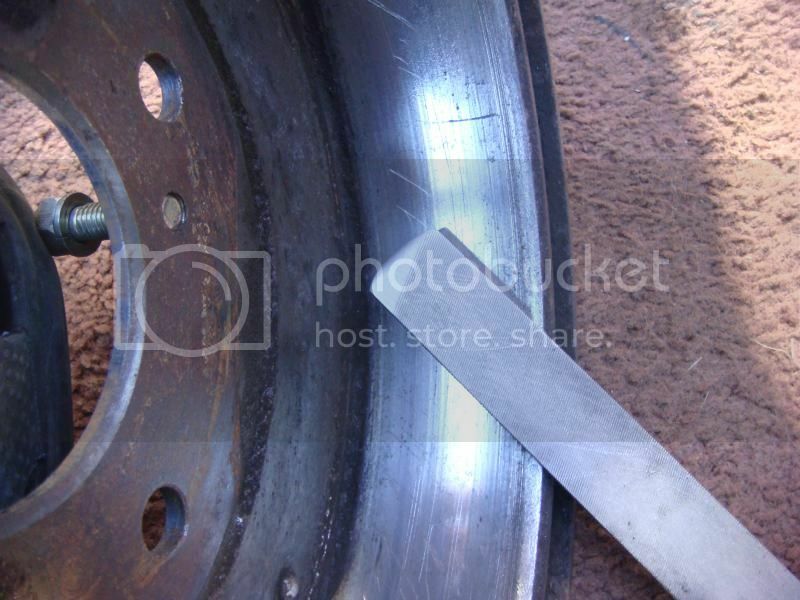 There are so many types of drum brake methods of operation, some are dual wheel cylinders, some with cylinders at the top, some (mine) at bottom, direction of rotation, leading and trailing shoes?, longer and shorter linings... I can't find anything that fully applies to my situation. Julian this is maybe true for the 510 with wheel cylinders at the top but my cylinders are at the bottom. If there is some good reason for more lining closer to the cylinder on the shoe to the front then it is lost when turned upside down. I found the term 'self energizing' used to describe the shoe moving in the same direction as rotation. 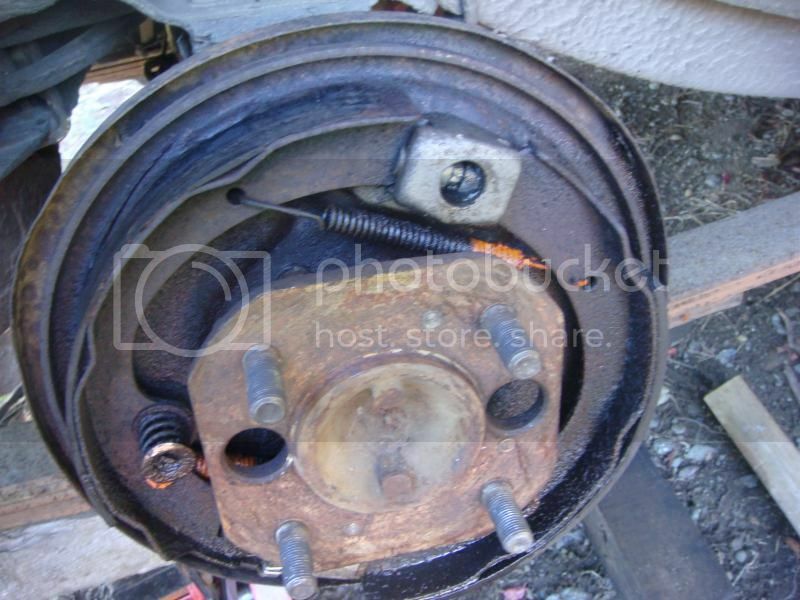 Well, searching my 610 FSM I found a picture of a rear drum, driver's side, so I know the direction of rotation. It clearly shows the shoe with the lining closest the bottom mounted wheel cylinder, towards the front. This would indicate that the 'self energizing ' shoe, the one that is pushed in the direction of rotation or the rear facing shoe, has the lining farthest away from the cylinder. Further, that the picture I have posted of my passenger side is correct as it is. Any nay sayers? The excerpt above covers all cars, the manual was written to cover PL510 through HL510. PL510s have the wheel cylinder at the top and therefore the square holes in the shoes are at top also. 610/710 and the A10 (HL510) are opposite with wheel cylinders at the bottom, square holes at bottom. It says place the shoe with the lining closest the square holes to the front. Then says the replacement shoes are opposite, then says they both seem to work the same.????? No mention is made about the shoe closest the cylinder traveling in the direction of turning being self energizing and griping better and doing more work than the other trailing one. Top or bottom makes a big difference here. So I replaced my shoes yesterday. This is the RR before change, so it turns clockwise. Cylinder at bottom, shoe on left moves in direction of turning and is self energizing, lining is farther away from wheel cylinder. BAM. Thoroughly loosened and lubed the adjuster, shoe rubbing points on backing plate, lugs and the center hole with anti seize. Drums needed the 12mm bolts to get off. Fled down the high spot around the outer edge and is better now. Adjust adjusters and set the parking brake cable adjustment, probably for the first time in it's life. Three clicks and car doesn't move. The PL510 is identical to what is pictured above in your post wheel cylinder at the bottom, and same type of adjuster at the top. Otherwise it looks like you got it all right.